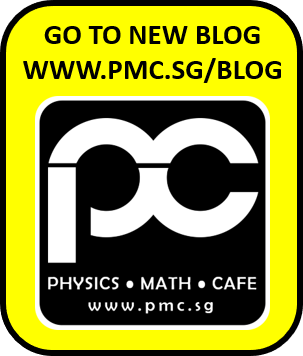 The Physics Cafe Story - Read our PMC blog here. What do you need to know about Kinematics? Velocity is the rate of change of position. If you go in a straight line from A to B, your velocity is just the distance between A and B divided by the time it took to go from A to B.
e.g. If the straight-line distance is 100 m, and it takes 20 seconds, your velocity is 5 m/s. The units of velocity have to be length / time : m/s and km/hr are pretty common. Sometimes teachers will just say v= s/t. What does the Δ mean? It is the Greek letter delta, and it means “change in”. (delta is like our letter d, and d here stands for difference). So velocity is (change in displacement) / (change in time). If initial displacement and initial time are both zero, then Δs/Δ t is the same as s/t. So if you start from 0, then Δ s is the same as s, but if you start from somewhere else, then to be very precise we want to recognize that velocity is related to the CHANGE in the displacement. If you move from 0 to 5, your new displacement from 0 is 5. So your change in displacement is 5. If you move from 5 to 8, your new displacement FROM 0 is 8, but the change in your displacement is 3.
or worse yet (Sf – Si) / (Tf -Ti). Don’t let this confuse you if you encounter it. If velocity is constant, then the graph will just be a straight line, because straight lines have the same slope everywhere. If the s vs t graph is not a straight line,we can still find the velocity at any particular instant in time by drawing a tangent line to the curve at that point and measuring its slope. Or we can find the average velocity for any period by just drawing a straight line between any two points on the curve and measure that slope. Acceleration is rate of change of velocity. We can write a = Δ v / Δ t. Units of (velocity / time) is (m/s)/s or m/s^2. If you are in your car going straight at 20 km/hr, and you speed up to 30 km/hr, your velocity changed by 10 km/hr. If you made that change in 5 seconds, then your acceleration was (10 km/hr) / ( 5 seconds) = (2 km/hr)/s. If the change in velocity is negative, then you have negative acceleration. Negative acceleration could mean you are slowing down, and we still call that acceleration. But it could also mean that you are speeding up in the negative direction! Let’s take an example of a ball thrown in the air. We decide to call the direction “up” positive. In the beginning the ball has positive velocity. Is it accelerating on the way up? YES IT IS! It is slowing down, so its velocity is changing. By definition, changing velocity is acceleration. The acceleration here is negative, because it is downward, and we have already defined up as positive. That negative acceleration is causing the velocity to become less and less positive as time passes. The ball is slowing down. At the top of the arc, the velocity is zero. The acceleration continues, though, so the velocity passes right through zero and becomes negative, and then it gets bigger and bigger in the negative direction. The ball is speeding up! The acceleration – the rate of change of the velocity – was the same the whole time, and it was ALWAYS downward. There was no time after you let go of the ball when the direction of the acceleration was anything other than downward. The result of that downward acceleration was a ball that was at first slowing down and then speeding up! But a better way to think about it was that the ball’s velocity was changing in the negative direction the whole time. The definition of acceleration is another definition you just have to learn. a = Δv/Δt. If you want to learn physics, you’ve got to just know this. If velocity is increasing at a steady rate, then acceleration will be a positive constant. If velocity is decreasing at at steady rate, then acceleration will be a negative constant. If velocity is changing, then acceleration is constant at 0.
and if acceleration is 0, the velocity graph must be flat. Be sure not to confuse zero acceleration with zero velocity. Zero acceleration means velocity is not changing. It could be 0 and not changing, but it could also have any non-zero value without changing. The useful set of equations that we can use for uniformly accelerated motion are sometimes called the SUVAT equations. This one is easy. It’s just a recipe for calculating average velocity and multiplying it by time to get displacement. It only works if acceleration is constant, though. You should already know that the average of 7 and 9 is (7+9)/2, so this equation should not be hard to understand, derive, or memorize. 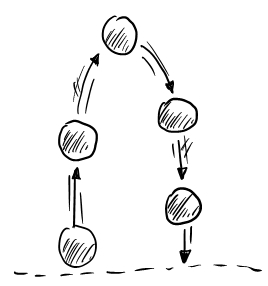 Ending velocity is just initial velocity plus the change that comes from accelerating for some period of time. This one should also be pretty easy for you to derive or memorize. It comes right from the definition of acceleration. This one is not so obvious, but it tells you how to find displacement of an object that is already in motion and then accelerates. The object gets some displacement just from the fact that it was already moving (that’s the ut part), and then it gets turbo-charged by the acceleration (1/2*a*t^2). This one is a little harder to memorize, but worth it. Not obvious or intuitive at all, right? I rarely use this one. Anything you can do with this one you can also do by combining two others. I didn’t get around to memorizing this one for years. (It is useful, though, in deriving the equation for kinetic energy: KE = 1/2*m*v^2). *Note that velocity, acceleration, and displacement are all vectors, but we are only dealing here with motion in one dimension, which means objects can only move forward or backward along a straight line. We will have only two directions: up and down, or left and right, or east and west, or positive and negative, or some other pairing of opposites. It is very important to remember that these equations only apply for uniform (constant) acceleration. Constant acceleration can include zero acceleration, of course. Where do those SUVAT equations come from? A lot of times, knowing how to derive an equation is not that useful when you are solving problems, but I encourage you to closely study the derivation of Δs = ut + 1/2*a*t^2, where they use the area under the curve, for two reasons. You can use the same technique to solve real problems. Second, you are going to see this same area-under-the-curve approach used again and again. For example when we figure out the energy stored in a spring ( 1/2*k*x^2) and when we figure out the equation for kinetic energy (1/2*m*v^2). Do you notice the similarity in form between those 3? It’s because they’re all derived by finding the area of a triangle. A triangle’s area is 1/2*b*h. If h is linearly related to b, you will always get something that involves 1/2*(some constant)*b^2. 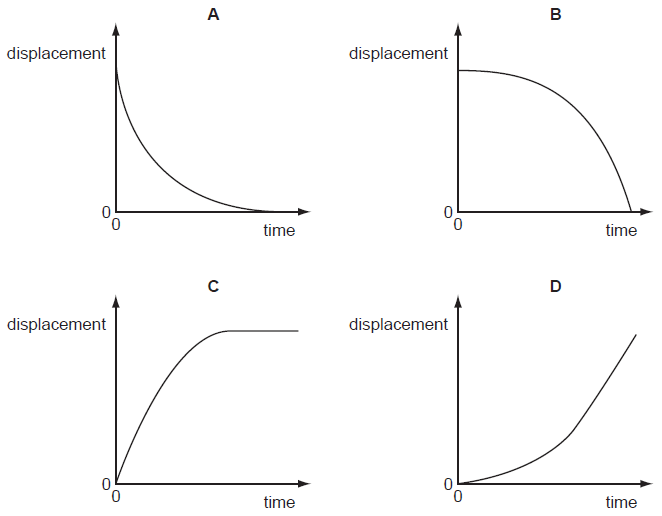 If you don’t see why displacement is the area under the velocity vs time curve, this video will help, and you should watch it, because this is a really important and useful concept that we apply over and over. © Copyright ThePhysicsCafe.com (Registration No. 201404177D). All rights reserved.